The David Blaine VIP Flyaway Sweepstakes is open only to natural persons who are legal residents of the United States of America or Canada (except Quebec) who have a valid social security or tax ID number, and who are at least eighteen (18) years of age. 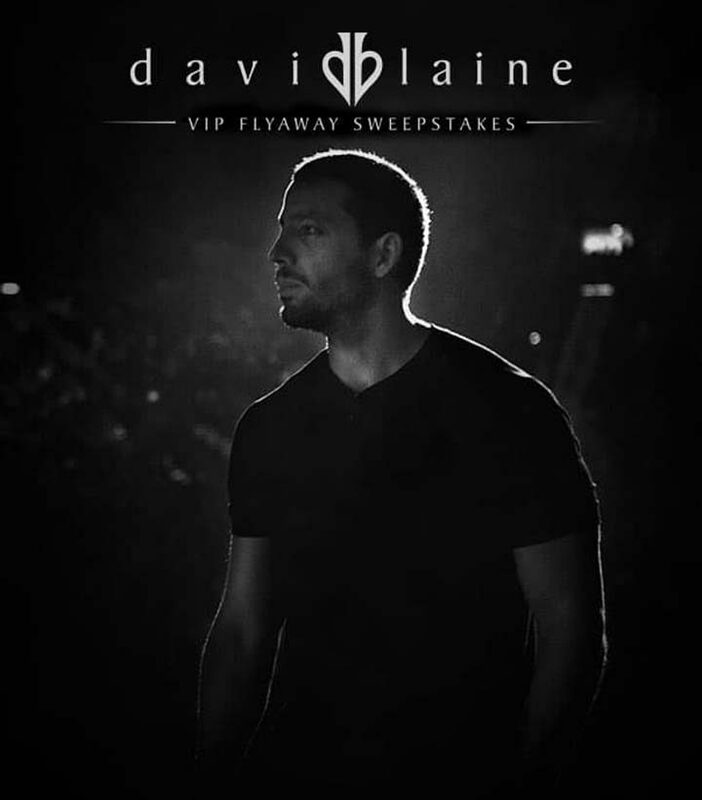 The David Blaine VIP Flyaway Sweepstakes ends at 12:00 PM Pacific Time on June 16. Visit the registration page located at davidblainevipflyaway.com and complete the registration form. Each participant is eligible to submit up to one (1) Promotion entry per day. One (1) Grand Prize consisting of a David Blaine VIP Flyaway to include two (2) front row VIP tickets to David Blaine at Saenger Theatre in New Orleans, LA; round-trip, coach class air transportation for two (2) from the airport nearest Grand Prize Winner’s home within the U.S. or Canada to New Orleans, Louisiana; and one (1) double occupancy standard hotel room for two (2) nights / three (3) days; and a 200.00 prepaid cash gift card to use toward ground transportation. Each VIP ticket includes meet & greet and photo opportunity with David Blaine, access to preshow non-alcoholic refreshments, one (1) deck of playing cards signed by David Blaine, one (1) specially designed David Blaine poster, one (1) exclusive David Blaine ball cap, one (1) exclusive David Blaine tote bag, one (1) commemorative VIP laminate, one (1) commemorative VIP ticket, access to VIP check-in with early entry into the venue, and access to crowd free merchandise shopping and on-site VIP host. Approximate Retail Value of the Grand Prize is: Two Thousand Six Hundred Dollars ($2,600).